It was a very busy weekend down on the Decoy Lakes complex, Sunday in particular saw most of the lakes taken up with club matches and the usual open. On Friday the Over 55s fished the in-form Cedar Pool in near-ideal conditions and Vince Hull caught steadily all day on the pole and pellet approach on peg 21 to finish with 133lb 1oz. Runner-up was Roy Whincup with 125lb 10oz from unfancied peg 14, then came Chris Saunders with 116lb 7oz. 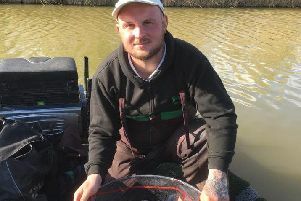 JVAC took on a strong Oakham Hookers side in round two of the Angling Times/Bait Tech Knock Out event on the Willows at Decoy on Saturday and lost out by 13lb. Oakham rod Paul Parsons took the individual honours from end peg 20 with 101lb 6oz, then came Guy Dew for JVAC with 77lb 10oz followed by Andy Kelk on 75lb 4oz. Sunday’s club match was fished on Six Islands where Perry Briggs on peg 17 topped the field with 122lb 12oz catching on paste short. Runner-up was Roy Whincup fishing meat for 113lb 3oz, followed by Andy Gausden with 111lb 13oz. Decoy Lakes Saturday Open, Beastie Lake: 1 Nigel Baxter 225lb; 2 Tony Evans 210lb 14oz; 3 Adam Major 176lb 15oz. Decoy Lakes Sunday Open, Willows: 1 Adam Playford 167lb 7oz; 2 Ben Townsend 165lb 4oz; 3 Chris Neal 149lb 9oz. Conservative Club, Decoy Lakes, Horsehoe: 1 Gaz Clingo 94 lb 11oz; 2 Richard Brown 89lb10oz; 3 Andy Kew 79lb 10. Hotpoint AC were at Decoy Lakes on Sunday using Lou’s Lake for their annual sweetcorn only match for the Barry Buckingham Shield. I am not at home fishing with sweetcorn but do have a knack of putting a few fish in the net in this match each year. I drew peg 14 and they decided to miss out peg 15. So it was happy days for me and I went on to catch 99lb 4oz and record my fourth win in six years in this event. Most of the fish I caught in the margins. Runner-up was Tyrone Horn with 91lb 12oz then came Vince Stapleton on 87lb 15oz.